The process by which Mandatory Palestine became Israel. At the end of World War II, the conflict over Palestine gained momentum. As early as 1942, the Yishuv, the Jewish community in Palestine, had turned to the United States for support of the Jewish state in Palestine. Even after the horror of the Holocaust, Britain refused to change its policy of allowing no further Jewish immigration. Despite the hundreds of thousands of Jews languishing in Allied displaced persons camps, the British locked the gates to Palestine. British ships stopped ships and forced the refugees into camps they had established on Cyprus. Despite expressions of world outrage, the British interned more than 51,500 Jews who were desperately trying to get to Palestine. Jewish resistance increased dramatically. The Yishuv gathered weapons for the war they knew was coming. Despite British intervention at every turn, the Haganah [literally “Defense,” the non-governmental Jewish military organization] prepared for military conflict, hiding guns in kibbutzim [collective communities] and training volunteers in orange groves. Arab terrorism increased. The Irgun and Stern Gang [armed Jewish underground organizations that rejected the Haganah’s policy of moderation and restraint toward the Arabs and the British] retaliated. The Irgun turned its forces against the British as well. In 1944, Menachem Begin became the head of the Irgun. Having escaped from the Nazis in Poland, Menachem Begin was subsequently arrested by the Soviets but survived. When he arrived in Palestine, he declared armed warfare against the British. Many in the Yishuv were angry because they feared that Jewish terrorist reprisals would turn world sympathy from their cause. Begin responded that the world didn’t really care; the Jews would have to kick the British out themselves. On June 29, 1946 ([later] called Black Saturday), the British arrested the leaders of the Jewish Agency, the organization responsible for running the Yishuv. This further radicalized the country. On July 26 the Irgun, after first warning the British, blew up their headquarters in Jerusalem, located in the King David Hotel. More than 100 British, Arabs, and Jews were killed. In order to keep the peace, Britain had more than 100,000 troops in the country. Their efforts were in vain. Arab snipers were killing people, Jews and British, daily. The Stern Gang was getting bombs regularly. The Irgun was attacking British supply lines, bases, and compounds. On May 5, 1947, a combined Haganah/Irgun raid blew a hole in the British prison at Akko (northern Israeli city, also spelled Acre), and 251 prisoners escaped. The British had considered the Akko prison invulnerable. And they were shaken by this audacious, successful attack. The British lost even more world support when they stopped the Exodus 1947, a ship loaded with 5,200 Jewish refugees sailing toward Palestine from Marseilles. Hand-to-hand fighting took place, but the Jews were overcome. The British transported the Jews back to France. At Port-de-Bouc, the Jews refused to get off the two British ships, and the French refused to force them. The British then sailed the two ships back to Hamburg, Germany, where they forced the Jews back into DP camps. The Exodus scandal shook the British government. Although still allied with the Arabs, the British had to admit that things were out of control. There was tremendous pressure from both the British Parliament and the United States to end the mandate. Finally, the British invited the United Nations to make recommendations to solve the Palestinian problem. They still hoped that the United Nations would recommend that the British retain control of the area. After many debate and compromises, the United Nations Special Committee on Palestine (UNSCOP) recommended an Arab state and a Jewish state (the recommendation was known as the Partition Plan). The Jews would get most of the coastal plain, with Jaffa being an Arab island. They would also get the Yizrael and Hulah Valleys [fertile valleys located in the north] and much of the Negev [a southern, arid region bordering Transjordan and Egypt and containing access to the Red Sea via the Gulf of Eilat]. The rest of the [land] would be Arab. Jerusalem would be an international city. (An interesting note: There is a story, verified by Mrs. Nelson Glueck, that Dr. Nelson Glueck, the late president of Hebrew Union College, played a central role in convincing the Yishuv to insist on getting the Negev. It looked like a very unappealing place. The Jews had succeeded in founding some small settlements in the northern desert, but the barrenness of the region was depressing. Most were convinced that the Negev couldn’t be made fertile. 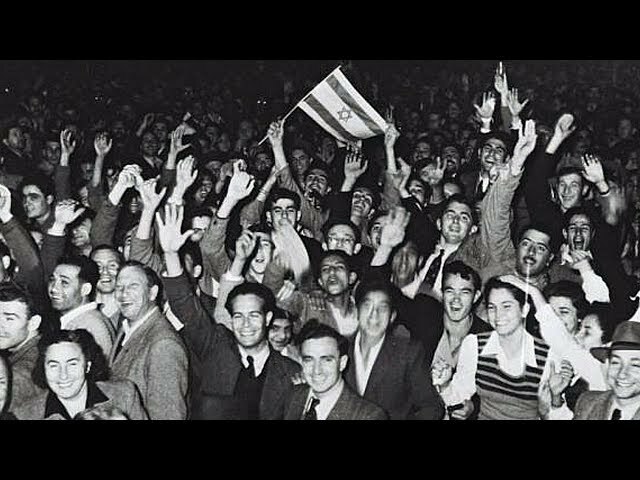 On November 29, 1947, by 133-13 majority, the United Nations voted that, beginning on May 15, 1948, if the Yishuv agreed [and it did], there would be two independent states in Palestine, and the British mandate would end.